XChange’s Derrick Choi is returning to Germany this summer to participate in the 2nd Annual Future of Transportation World Conference in Cologne. Derrick will be discussing the impact of disruptive urban mobility on airport systems and the cities they serve. His Day 1 topic – “Terminal Autonomy: Future-Proofing Airports for Turbulent Technological, Regulatory and Market Skies Ahead” – will be presented in the Urban Mobility and Smart Cities conference stream on Tuesday afternoon, 19 June 2018 at the Köln Messe. Derrick is also reprising his moderator role at the conference’s Urban Mobility and Smart Cities conference stream; leading a round table discussion on Day 1 that revisits some of the livelier debates from last year’s inaugural conference. The topics include debating the biggest mobility challenges facing cities of the future. The discussions will focus on whether and how can cities effectively collaborate with mobility providers in realizing more seamless, practical and economically-viable transportation systems that yield mutually beneficial outcomes. XChange’s Derrick Choi participated as a respondent at the URBAN CONSTELLATIONS Think Tank hosted by Aerial Futures from 05-06 April, 2018 at NewLab in the revitalized Brooklyn Navy Yard. In response to one of the key discussion questions posed at the conference – Multiple-airport cities present new challenges for passengers and urban dwellers…The fragmentation of airports in a single city, frequently owned and operated by different governing bodies, can lead to unpredictable and even confusing experiences. How should we rethink the multiple-airport city more holistically? – Derrick shared some of XChange Architects’ ongoing research on the potential of airport systems in congested, large metro-regions to reappropriate extant infrastructure and civic spaces as virtual extensions of the airport network – effectively providing airports a set of operational “tentacles” in city centers to literally connect with passengers miles and hours before they set foot in the terminal building. As many airport functions are increasingly virtual and optimized – resulting in dramatic reductions in conventional space needs – imagine airports processing passenger checked baggage in urban centers and other alternative, off-airport locales, as illustrated in the renderings above that reimagine iconic urban spaces and infrastructure being repurposed as airport check-in facilities. While this is a commonly accepted global practice, here in the United States, there remains considerable operational, jurisdictional, regulatory and cost-sharing complexities that can render some of the most simple ideas unachievable from the moment that are conceived. Surely, we can do better in our major U.S. urban centers. The day-long Think Tank sessions, highlighted by thought-provoking “impulse talks” by Mitchell Joachim of Terraform One and Campbell Hyers of Intersection remind us that the enhancement of the Airport’s relationship to its complex urban ecology can no longer be reliant on the physical solution alone; rather it must recognize that the passenger journey – and by extension, the “airport experience” – has been radically expanded from one’s door way to the jetway. Accordingly, a completely new set of expectations, standards and systems are emerging – leveraging atypical solutions, different perspectives and “out-of-the-industry” thinking to help deliver tomorrow’s airport systems. Here comes the Sun: Solar Arbor tour continues to Newton Centre! 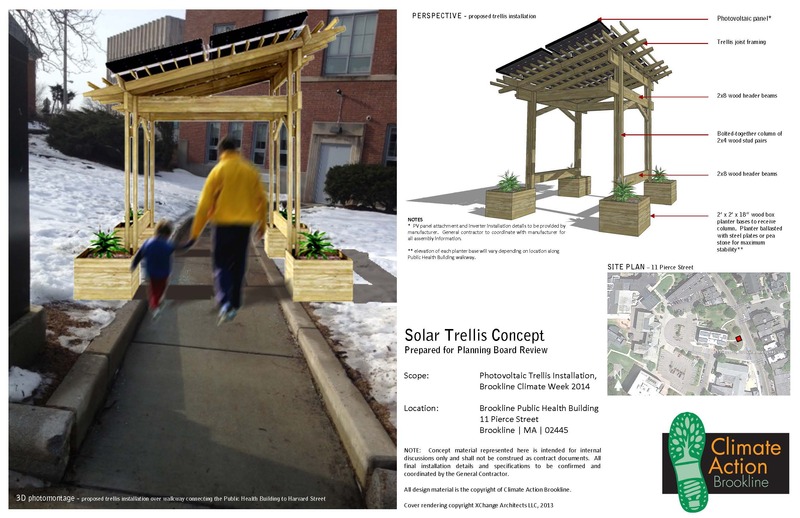 As we prepare for the unofficial start to the Summer, we are especially delighted to learn that our photovolatic(PV)-powered trellis concept designed for the 2014 Brookline Climate Week – held in January of this year – has been re-installed for summer duty in nearby Town of Newton. 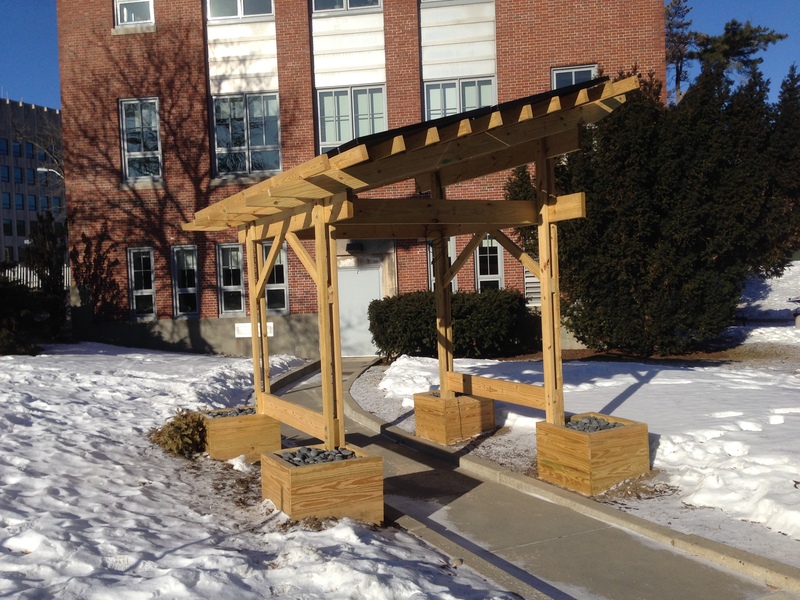 The “Solar Arbor” is based on ideas generated from a collaboration between Mary Dewart of Climate Change Action Brookline and Susan Israel of the Energy Necklace Project, and installed by solar panel provider RevoluSun. Directly in response to Landscape Designer Mary Dewart’s inspiration from the practical application of solar technologies in the domestic setting as demonstrated in the recent US Department of Energy Solar Decathlon competitions, this simple trellis system seeks to amplify the relative ease of installation and the myriad design possibilities of PV installations in a domestic context. Images and drawings copyright XChange Architects LLC. 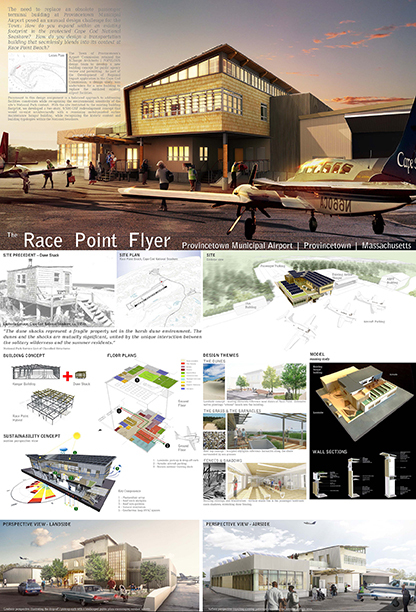 Our design concept “Race Point Flyer,” a proposed redevelopment of the passenger terminal facilities at Provincetown Municipal Airport was recognized in the 2014 AIA Center for Emerging Professionals Annual Exhibition. The exhibition at the American Institute of Architects (AIA) National Headquarters in Washington, D.C., runs through the end of April. 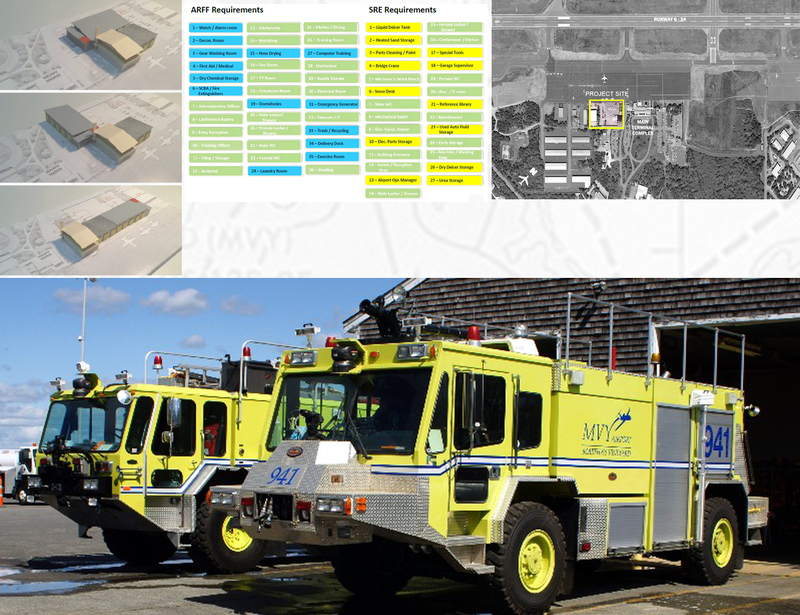 The JACOBS | XChange Architects Team has been selected by the Martha’s Vineyard Airport Commission Designer Selection Committee to design the new integrated Aircraft Rescue & Fire Fighting (ARFF) and Snow Removal Equipment (SRE) facility intended to replace the airport’s existing post-war era building. The design-only phase of the work will include preparing contract documents for the demolition of the existing ARFF/ SRE Building located adjacent to the airport’s General Aviation Building, relocation of an existing airfield lighting vault, and the construction of a new ARFF/SRE building at the same location. The proposed new ARFF/SRE building is anticipated to provide additional space for offices, training/conference room, staff day room, sleeping and bathroom/shower facilities, kitchen, laundry room, extinguishing agent storage facility, vehicle maintenance areas, SRE & other airport equipment storage, vehicle washing bays, parking areas and other miscellaneous spaces. The anticipated 12-month design phase of this project will be overseen by Daedalus Projects Inc., the Owner’s Project Representative for the Martha’s Vineyard Airport Commission. Stay tuned for more updates on this project. All images, drawings and photographs courtesy Martha’s Vineyard Airport Commission and the JACOBS | XChange Architects Team. 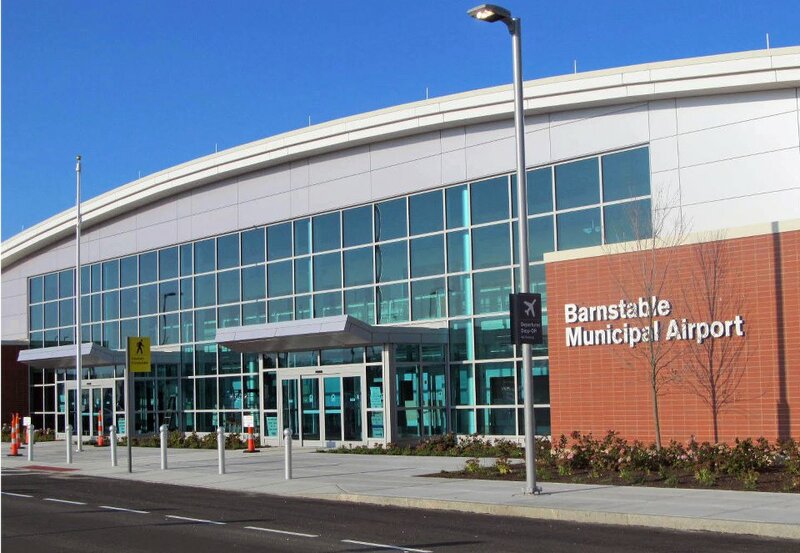 XChange Architects, as a subconsultant to JACOBS, has been retained to provide A/E design assistance to Barnstable Municipal Airport for the maintenance and repair of the Airport’s passenger terminal facilities – completed by Suffolk Construction in 2011 – the capstone of a $40 million airport improvement program. The task order work will include baggage make-up area improvements, airside weather protection and fenestration improvements, and building life cycle management monitoring. The work is eligible for funding under the MassDOT Airport Safety and Maintenance Program. View of main terminal entrance & landside curb. Image courtesy Barnstable Municipal Airport. Barnstable Municipal Airport, located in Hyannis, Massachusetts on Cape Cod, provides commercial and general aviation services to Boston and the islands of Martha’s Vineyard and Nantucket. The Airport also serves as the corporate headquarters for regional airline, Cape Air. It is owned by the Town of Barnstable and managed by the Barnstable Municipal Airport Commission and its staff. Today, the airport consists of a new 35,000 sq. ft. passenger terminal, a new 85 ft. air traffic control tower, a new aircraft ramp and a new vehicle access road—all opened at the end of 2011— extensive parking facilities, a rescue and maintenance building and an aircraft fuel farm. More than 40 private tenants lease hangar space on parts of the airport property. All photos, images and drawings copyright Barnstable Municipal Airport and XChange Architects LLC, unless otherwise noted. 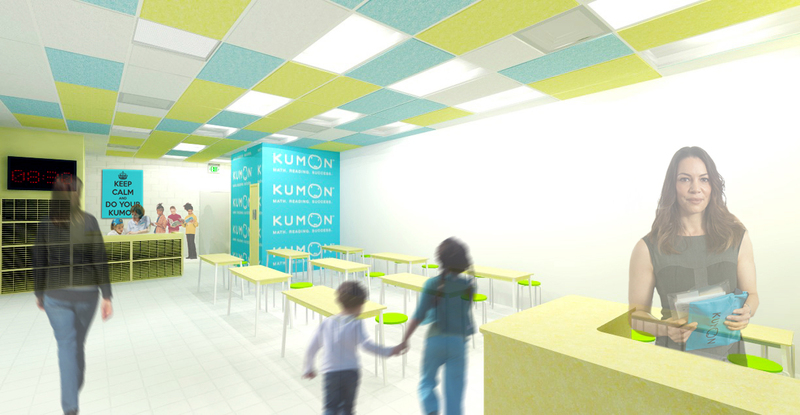 Interior perspective – proposed main classroom, Kumon of Needham. XChange Architects is designing the new home of the Kumon Learning Center of Needham | MA. After a lengthy site selection process, conducted with the assistance of Cullinane Real Estate Services LLC, a prime storefront location on Chapel Street was identified in the heart of Downtown Needham, directly across from Town Hall. The proposed change of use was unanimously approved by the Town of Needham Planning Board on November 19, 2013. Providing unique, individualized instruction for math and reading skills for K-12 students, Kumon is helping millions of children in 47 countries and regions on six continents. Construction for the new Kumon of Needham is scheduled to be completed in early 2014; coinciding with the 60th anniversary of the founding of the Kumon method. All photos, logos, images and drawings copyright Kumon and XChange Architects LLC, unless otherwise noted.